Your puppies first meals are the key to their structural development for the rest of their lives. After a puppy is weaned, they are at the most crucial development stage ever. They need rich digestible protein and fat, along with nutrients that help their connective tissue and muscle develop, as well as their immune systems. 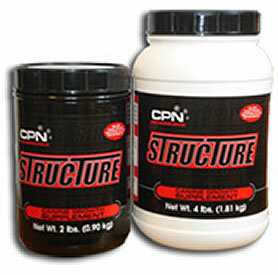 Structure supplies these nutrients with a premium blend of ingredients. This premium blend consists of milk and egg protein from whey protein concentrate, dried casein, Omega 3 enriched pasteurized and dried whole egg, egg yolk, vegetable oil blend, probiotics, digestive enzymes, Vitamins C, E and more. The first months of a puppy's life is the most critical stage of physical development they will ever go through. In the wild, a puppy may nurse for months before they are weaned onto solid food entirely. When they are, it is in the form of regurgitated meat from the mother's stomach. This is almost unheard of with today's domestic dogs, because of larger and larger litters, combined with other factors, which keep mothers from being able to let the puppies nurse as long. Structure delivers the kind of nutrition that nature intended puppies to have. What sets Structure apart from other growth formulas out there? The answer is, consistency and research. Consistency that can only be achieved by operating your own manufacturing process, research into what works and what doesn't. Other companies have to rely on others to take the care and detail necessary to produce consistent batches every time. Creating rapid growth alone is not enough for a product to be considered successful. Dogs need balanced growth where muscle and soft tissue is growing as rapidly, if not more so than bone. That is what your puppies get with Structure. Adding Structure's formula to a pregnant female's diet can boost general nutrition and health. The size and health of your puppies is a direct result of what you feed your female during pregnancy. Bigger, fatter puppies are more likely to survive and thrive.